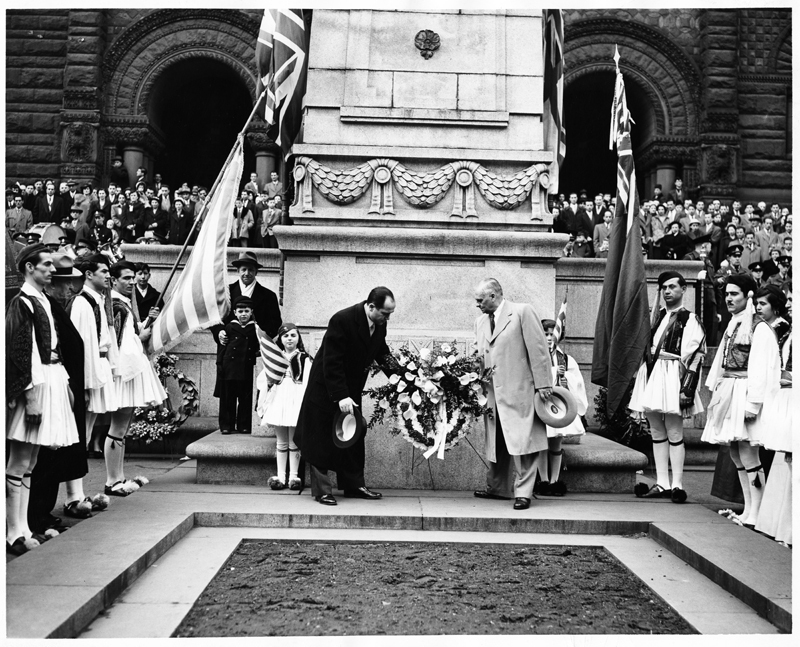 Image of Greek Consul, Mr. Steve G. Rockanas (left) and President of the Greek Community of Ontario, Mr. Charles Brown (right) present a memorial wreath at the Cenotaph outside Toronto's City Hall. The men are flanked by young men and women in traditional Greek costumes and a girl and boy holding Greek flags. Large crowd gathers along steps to city hall. 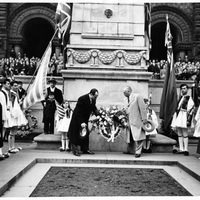 Photographer instructions on reverse read: "Time: 12:45 Place: St. George's Greek Orthodox Church, 117 Bond Street For: Parade will set out from here to city hall where Greek Consul Mr. Steve G. Rockanas will lay wreath at cenotaph. Should have shot of parade and laying of wreath." Toronto Telegram, “ASC08803,” York University Libraries | Clara Thomas Archives & Special Collections online exhibits, accessed April 21, 2019, http://archives.library.yorku.ca/items/show/4114.